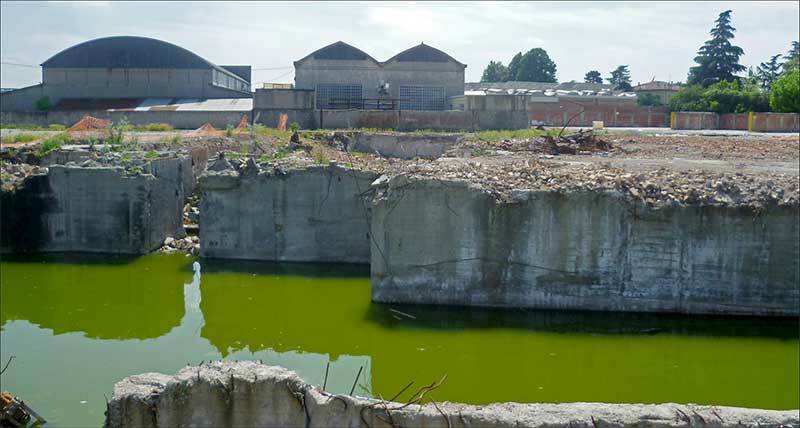 A derelict manufacturing facility required remediation before it could be sold to be redeveloped. 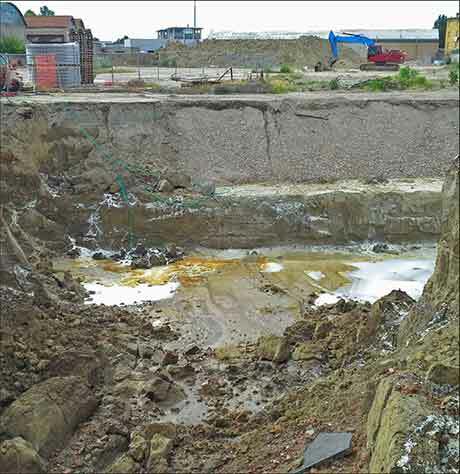 Manufacturing activities had resulted in large areas of the subsurface being impacted with a range of contaminant including chlorinated solvents (CHCs), petroleum hydrocarbons (TPH), benzene, and hexavalent chromium (CrVI). 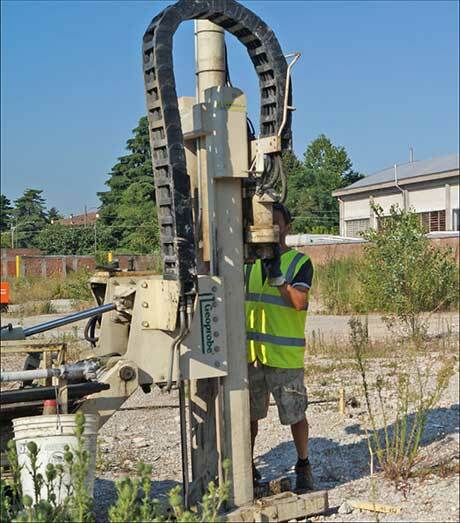 REGENESIS worked with the Environmental Contractor, to devise an accurate and multi-faceted approach to target all the contaminants of concern in the soils and groundwater of the site. 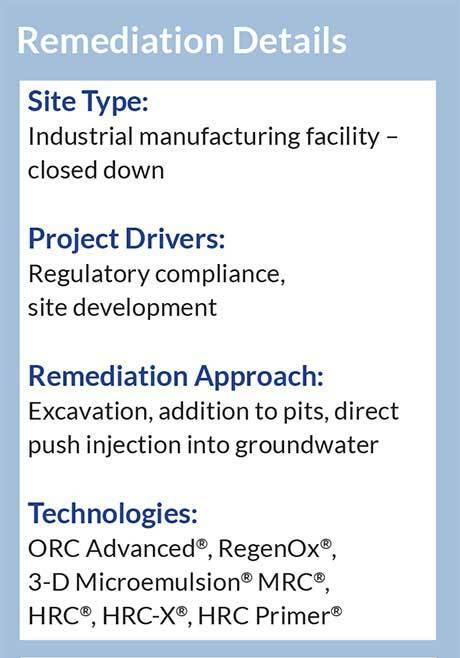 The Environmental Contractor oversaw the excavation of the impacted soils and completed the in situ treatment across the site with REGENESIS (as detailed below). A total of 4 excavations were made on site, of which two were shallow and the other two deeper, intersecting the impacted groundwater. RegenOx and ORC-Advanced were placed directly into base of the excavation where it intersected the groundwater, to provide In Situ Chemical Oxidation (ISCO) and Enhanced Natural Attenuation (ENA) of the residual TPH and benzene contamination. 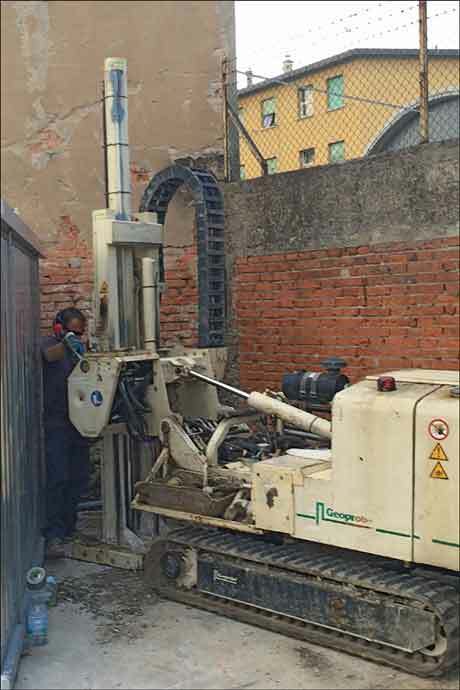 3-D Microemulsion (3DMe) was added to the base of the excavation in order to provide Enhanced Reductive Dechlorination (ERD) of the residual chlorinated solvent contamination (chlorinated ethenes and dichloropropane). 3DMe is a high-volume product and so could be used to easily cover the wide excavation base. 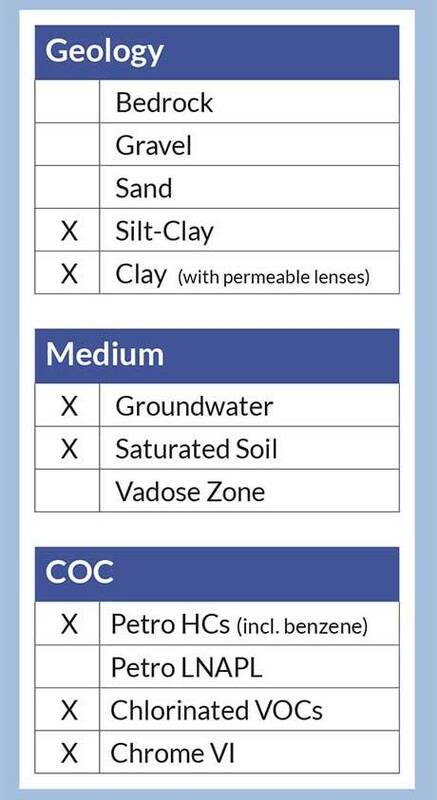 The HRC product family was used in the low permeability clays adjacent to the excavations. HRC is a low volume product and so can be easily injected into tight formations. HRC will diffuse electron donor reagents into the clay’s pore spaces, degrading the contamination within. HRC-X was included in the design to provide longer-term treatment (5 to 7 years from application) and address the potential for back diffusion and prevent rebound. A number of direct push injections were also completed underneath the excavated areas, where the excavations did not intersect the groundwater. 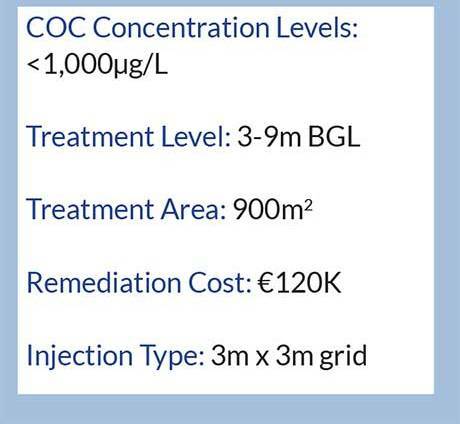 Metals Remediation Compound (MRC) is designed specifically for the treatment of hexavalent chromium Cr(VI) in groundwater. On this site, it was co-applied with HRC Primer and HRC to target CrVI in two hotspot areas. Direct push treatment was possible even where access was difficult. Validation of the project is currently ongoing, but interim monitoring shows a reduction in all contaminant concentrations.